Not Your Mom’s Musical Theater brings its unique brand of theater up north for two performances only – Saturday, May 10 at 7:30 p.m. in Littleton, and Sunday, May 11 at 2:30 p.m. in Plymouth. Tell all your northern friends to join us – or come cheer us on yourself! We’re touring with the Arts Alliance of Northern NH and we can’t wait! Who are we bringing? Oh, no one special…just a bunch of Top Ten and Finalist NH theater award nominees including Mario Arruda and Ally Bergendahl (our recent Zombie Prom leads), Jocelyn Duford (you remember, the woman who had you in a puddle at the end of Weird Romance?) and Joey T., Miss Strict herself! Don’t miss this all-star cast singing their greatest hits. Learn more at www.aannh.org – no one is turned away for inability to pay, pretty cool! And make sure you’ve got May 25 at 4 p.m. on your calendar – all the stuff you didn’t know you’d missed from 1974’s theater season, including The Magic Show, Over Here!, Mack & Mabel, and much more! 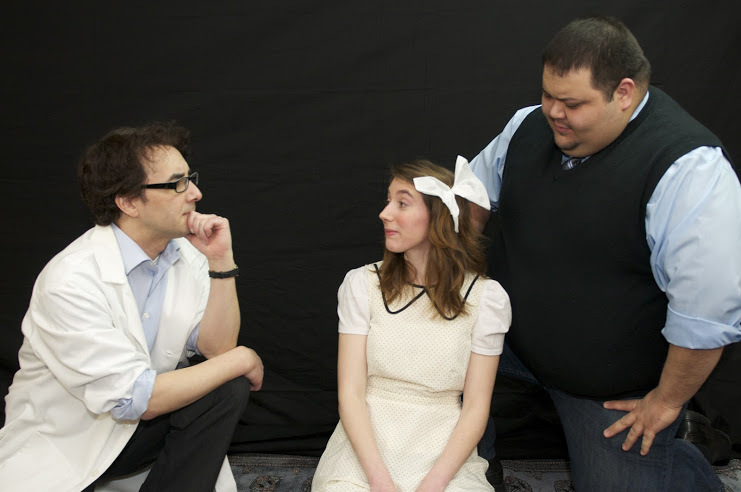 Don’t miss your last three chances to catch the critically acclaimed ’50s parody Zombie Prom! Tonight is VIP night – for an extra $15, stay for the prom after-party, where we’ll have a live band, plus food from local restaurants, makeup artists and photographers to get you fancied up or zombified, raffle prizes, swag bags, a performance by Lady Luck Burlesque, and more, all included! Arrive when doors open at 7:30 or soon after to get the best seats for tickets for tonight. Hope to see you at the prom! p.s. Click the photo to see what the Nashua Telegraph had to say about the show – we are honored! Come see what all the fuss is about – Zombie Prom opens tonight! Plenty of tickets at the door for tonight’s show. Let’s do this! Derry Opera House at 8 PM. Be there, with friends! 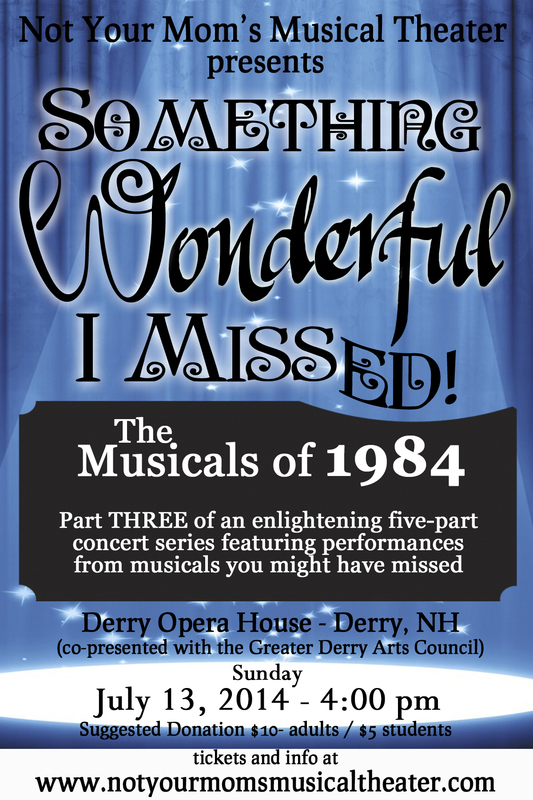 Don’t miss your one and only chance to hear music from the musicals of 1983, including La Cage Aux Folles, Baby, plus more obscure shows like Dance A Little Closer and A…My Name is Alice. Don’t miss it! 4 p.m. at the Derry Opera House. Admission is by donation at the door, so join us! Something Wonderful I Missed: The Musicals of 1963 rescheduled for tonight, and tickets are up for Weird Romance! Hi all! Happy Friday! Show tonight at 8 p.m., plenty of tickets at the door for your suggested donation of $10 ($5 students) or whatever you are able to do. No one will be turned away, we’d love for you to catch this hilarious evening! With two emcees and some amazing performers, you are truly in for a treat. Songs will include those from Oliver!, She Loves Me and a bunch more I bet you haven’t caught yet – ever heard of Tovarich? New venue for THIS NIGHT ONLY is our OLD venue, St. Peter’s Church, 3 Peabody Row, next to Mack’s Apples in Londonderry, NH. Come join us for two hours of pure fun and inspiration! Lastly, enjoy this photo and go get your tickets to our Weird Romance at the Derry Opera House, with music by Alan Menken and two sci-fi musicals you do not want to miss. You’ll laugh, you’ll cry, and you’ll walk out singing a new song or two. It’s just a great show. Don’t miss it! Thanks for spreading the word and helping us bring some magic and fun to NH! This orchestra, this cast, this show….are unlike anything you’ve seen before. If you haven’t gotten your tickets yet, what are you waiting for? You’ll get entered into a raffle if you purchase in advance, plus they’re cheaper…but you must purchase at least a full day in advance. Purchase by this evening if you’re coming tomorrow to save $2 per ticket. That might buy you a beer at the show! Don’t miss the NH Premiere of this powerhouse of a musical!